Creatively designed range of Handmade Bird is offered by us at reasonable prices. The image of the bird such as hen, peacock, hen, etc is carved in the beautiful manner. These are excellent decorative items and you could keep them anywhere. 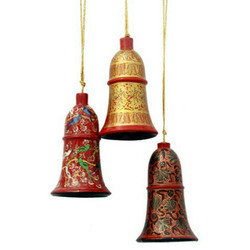 Made from high quality material, these are available in mesmerizing range. FELT EAR HANGINGS AND STUD. RED AND WHITE COMBINATION WITH BEADS FOR CHRISTMAS. CAN BE CUSTOMISED IN COLOUR . Our company has gained accolades in offering a quality assured assortment of Ornament Felt Cat. The Ornament Felt Cat we offer is widely demanded amongst the clients for its unique appearance. These products are tested for their quality before final dispatch. Moreover, offered products are known for their unique appearance.